Author Bill Wessex served for many years in the Royal Navy after the Second World War. This novel is based on many of the stories he heard about wartime exploits, intertwined with a narrative about a young leading seaman. The book incorporates many actual events but, judging by his brief biography, also mirrors some of the author’s own experiences at sea, albeit transposed to the Second World War. The bulk of the book covers events in the Far East and the Japanese invasion of 1941, and subsequent escape of the protagonist and some of his comrades. The book imparts a wealth of information about life at sea and the work of a leading seaman. 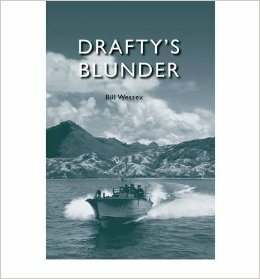 Some of the dialogue is a bit stilted in places but for anyone with an interest in the war at sea and the campaign in the Far East ‘Drafty’s Blunder’ is worth a read.